Artefacts from New Zealand Pt. 2: Secrets, death and destruction. Mr H. Goodsall is like most people in history from pre-internet times. Upon his death he faded into non existence, with little to document that he walked this earth. Internet searches brought up nothing, and short of flying over to New Zealand and searching the archives of councils and newspapers, there’s really nothing to be easily found on the man. I don’t even know if he went on to become a particularly good typewriter mechanic; if he ran his own shop or worked in someone else’s workshop. There’s simply nothing to be found through the supposed information super-highway to find him. But something remains. The house that he lived in when he first acquired the Ames manual that I featured in the last post. His name and address were both hand written and typed in the manual, and naturally I felt an urge to have a look at where he came from. 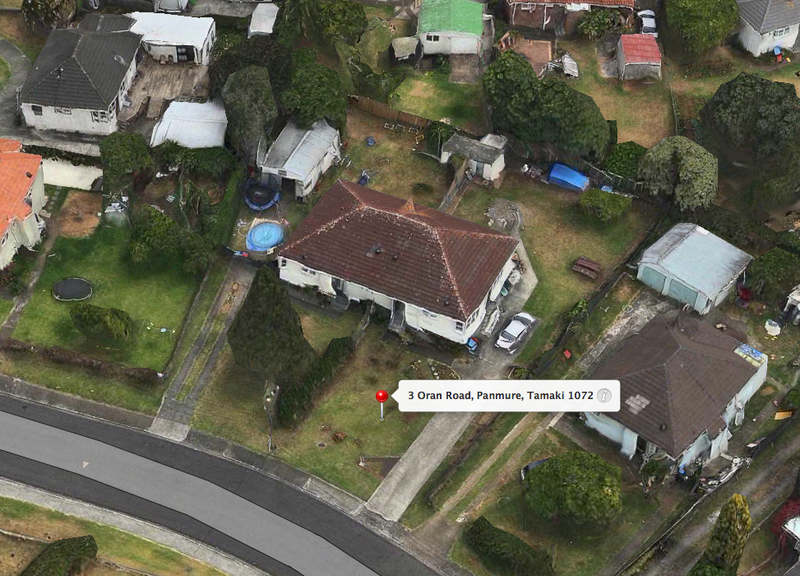 So I powered up Apple maps and found the address – before clicking into ‘3D mode’ to get a better look at the house he lived in. The house looked aged and warped – as though it had been recently thrashed by a severe storm. The car in the driveway looked as though it had tumbled down an embankment. What appeared to be debris from the house lay about the yard, and the lawn looked like it had been recently dug up for use as a minefield. It just looked like the kind of neighbourhood that you would feel uncomfortable driving around. Apple maps has a tendency to do this. It often leaves bridges and structures looking like they were collapsing or melting away into the environment. 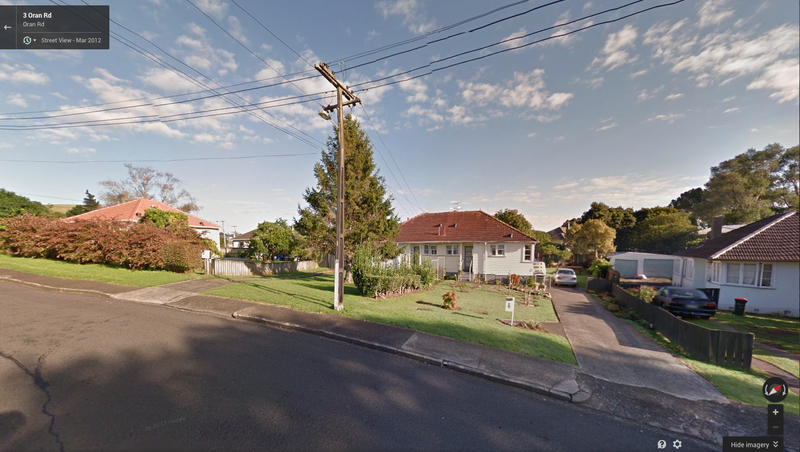 So just to be sure, I popped into the ‘street view’ app of another search engine and had a look at what the house really looked like from the ground. However from that view it looked like a gorgeous little weatherboard house. It looked nice enough that even I would live there. It had a well tended garden and looked incredibly clean and tidy. So much for a storm-lashed end of the world. This house looked happy to live for at least another 50 years. Sadly that was it for what I could find on Mr H. Goodsall. When I searched for the other address – which simply read “Bailey’s – Dingwell Building, Lauren street”, I uncovered nothing. 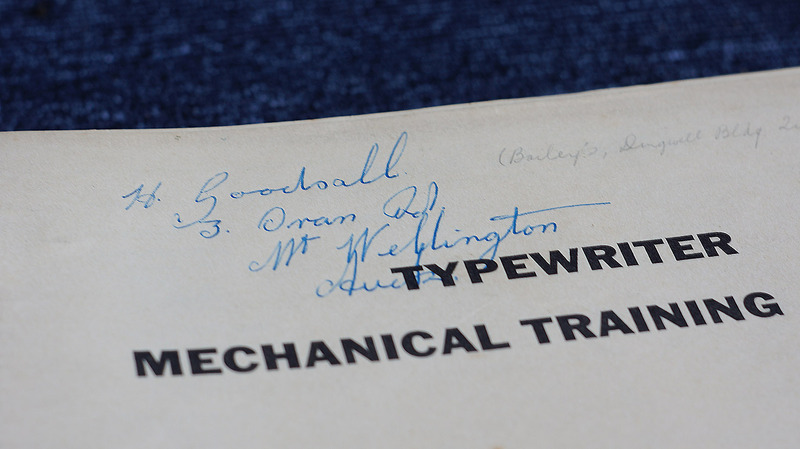 The trail sadly ran cold on the history of the original owner of the Ames manual. However, while the Ames manual yielded little about its past, the Blickensderfer 7 seemed to be a treasure trove of surprises. 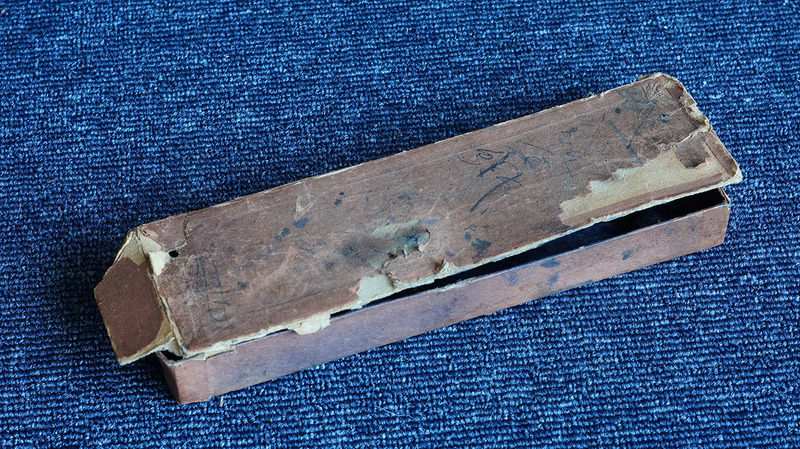 First – was ‘the box’. The sun had gone down by the time I had arrived home after picking up the Blickensderfer from the seller in St Kilda. So it could have been the low light and not just my eagerness and excitement that first caused me to miss the ‘the box’. I hadn’t spotted it at the seller’s place, and I didn’t see it hiding it for the first 10 minutes that I was looking over the typewriter. To be fair, with all the dust and grime on the machine it was hard to see it while it was tucked under the keyboard. But when I went back and looked at the original auction photos, it was no-where to be seen. I found it by surprise when I pushed a finger under the keyboard and felt it dislodge from behind some jammed keys. It was the same width as the keyboard, so it sort of looked like a cardboard backing behind the type bars at first. The box and the keyboard. Now that all the dust has been removed from the machine I almost feel embarrassed that I hadn’t spotted the box immediately. But I do remember spending a few tense moments trying to extract the box from under the machine with as much care as possible – in order not to destroy it. Once free, I unloaded it onto the table and at first was confused, then surprised by the minor treasures that it contained. The Blickensderfer type-ball was easy to identify, however the other bits and pieces seemed odd. 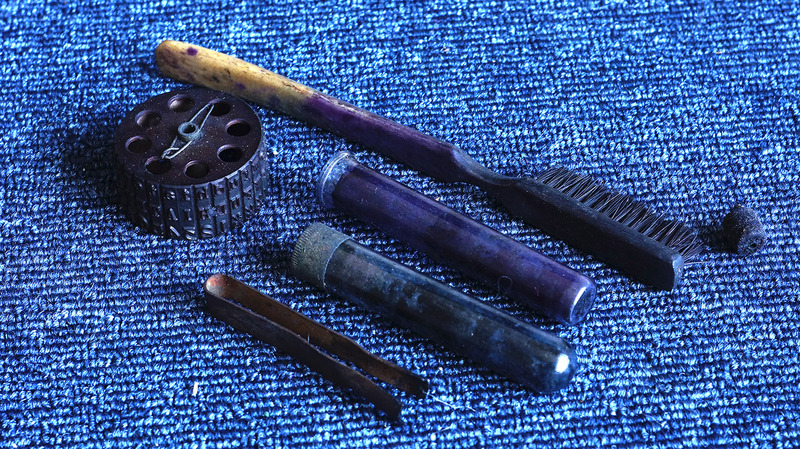 I found two glass tubes and a set of metal tongs as well as a brush and a couple of loose little bits rolling around. The brush is clearly a type face cleaner, and is stained thick with ink. Creepily the brush’s handle is made from bone, and I am pretty confident that the bristles are densely packed horse hair. The tongs made more sense when I realised what was contained inside the glass tubes: unused – but sadly dried, ink pads for use on the Blick. “This is the original packaging that the replacement pads came in” I thought to myself excitedly. They contained 5 pads, and were either sealed with a snug fitting metal cap, or a cork stopper. Pieces of the original cork from one of the tubes were running loose around the box, as well as some of the original ink pads. The tongs have been specifically curved so that they could grip around the ink pads for removal from these tubes. Naturally you would use the same tongs to remove a spent pad from the Blickensderfer, and replace it with a new pad. There was more yet to find hidden inside the case of the Blick. 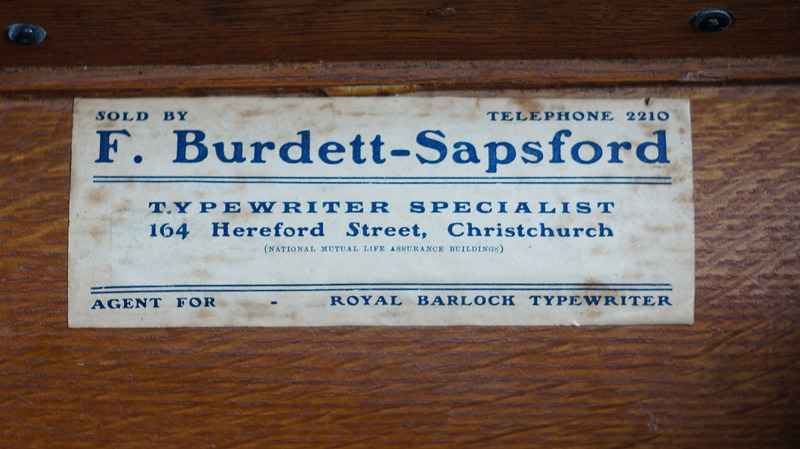 In the underside of the lid is the original sold-by label that was slapped into place on the day that it left Mr F. Burdett-Sapsford’s workshop when they sold the typewriter. Unlike Mr H Goodsall, there’s a lot more about Francis Burdett-Sapsford to be found online – despite the chap dying well before the Ames manual was even printed. Francis ran a successful racquet repair business out of a shop in Hereford street in Christchurch, but turned his shop into a supply store for fabric and materials for the local interior decorator set. Beside this, he was also considered the local typewriter expert for the city. While I have yet to uncover details of the trial in which he was asked to be an expert witness on typewriters in, the local anglican parish church felt it was important to document this detail in their record of the graves that occupy the parish’s cemetery. He emigrated from England to New Zealand in 1880 and immediately set himself up in a business resetting razors and repairing typewriters and tennis racquets. By the time this blicksenderfer was sold by him in 1909, he had well and truly established himself with a very successful business in the city. But it would all come to an abrupt end about 6 years later. Francis died soon after this machine was sold, and the business was then passed to his son, who was also named Francis. However Francis junior found himself caught up in the horrifying miasma of the First World War when the he and the ANZACs landed on the beach at Gallipoli in 1915. On the 25th of April he was ripped apart by gun fire as he tried with his fellow soldiers to climb from the beach into the dunes on the first day of the infamous battle that happened there. One of Francis’s letters to his mother even made it into a book about letters from the war. 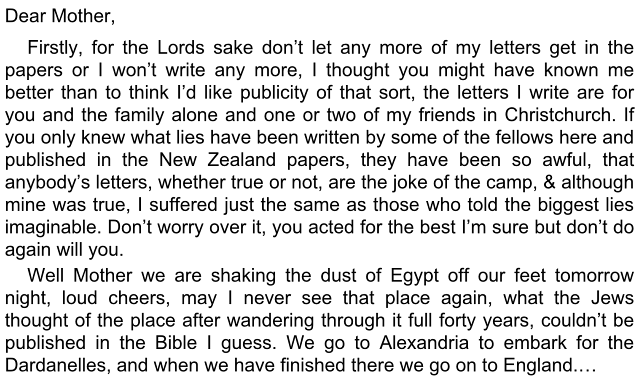 While it doesn’t say much, it is a somewhat amusing transcript to read – as he tells off his mother for letting the New Zealand newspapers print his letters. I wonder if they were originally written on a portable typewriter of some kind. With the address of the workshop in hand I again clicked into ‘street view’ in the hope that the original building that the shop occupied would still be in Christchurch. 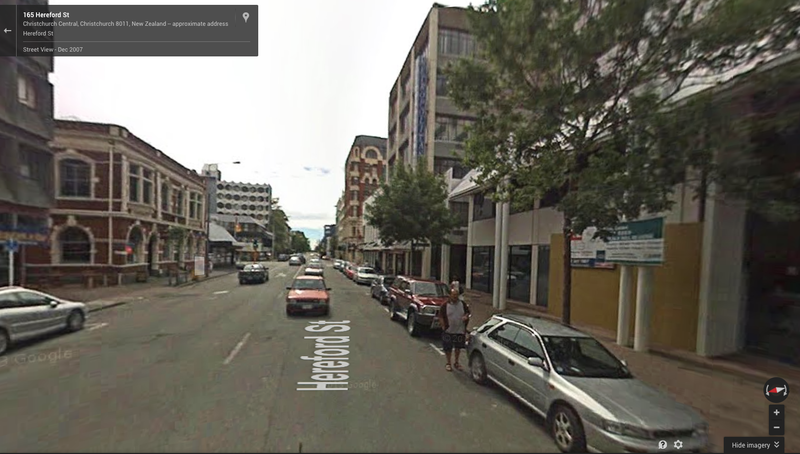 In this photo, Hereford street is a busy and densely occupied city space with plenty of historic buildings still lining the road. Sadly the original building where the typewriter workshop was located in had been replaced by a modern concrete, glass and painted steel piece of blandness that was so dull that it was struggling to find an occupant to lease it the day the street view photos were taken. However, there was still one more shock to come as I looked up as much as I could about the street where the typewriter shop had originally been. Once again Apple’s maps showed me a town that was filled with warped and mangled buildings and piles of rubble. Sadly, this time it was the truer picture of how the city looked now. 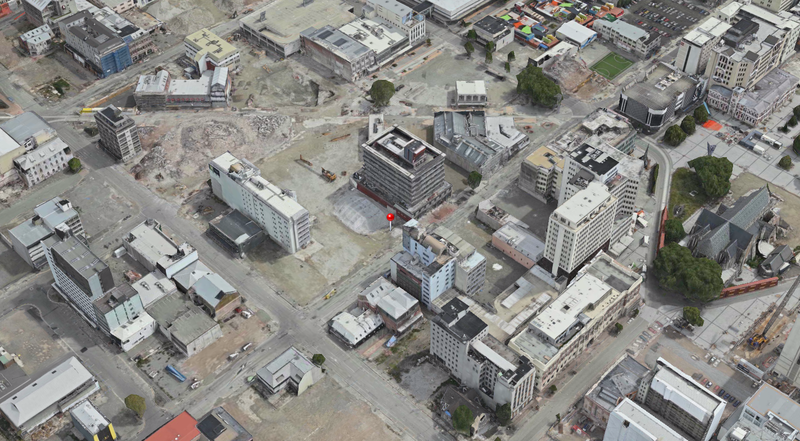 I’d never really looked at the scale of the destruction of the 2011 earthquakes in Christchurch, but Apple maps documented how the city now looked with almost grim accuracy. 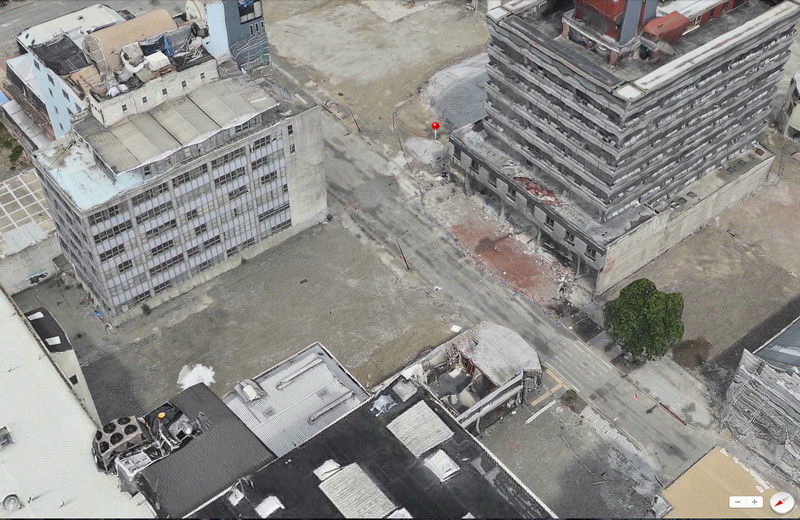 The street view camera’s photos were dated to 2007, where the city looked like lively was crammed densely with buildings filling every possible space. Now Christchurch looks spacious and roomy, with nothing but neat piles of rubble along with the presence of earth-moving equipment being used to tidy up and tear down further damaged buildings – to tell what has happened. The streets were empty, and it looked like the german city of Dresden did when its reconstruction began after the Second World War. I was genuinely shocked. I know people from the area, and had heard a lot about what had happened to the city during the quake. I’d seen the photos of the rubble and the torn up streets with mangled cars, but I truly didn’t know how much of the city had been damaged and would need to be torn down because of the quake. I scrolled across the accurately constructed 3D landscape of carless streets and rubble, and just looked in bewildered wonder. The ‘pin-drop’ in the photo above points to the location of where the typewriter shop was originally located. The dull building that had inhabited the site previously was no longer there, as well as the sky-scraper next door – and the one next door to that. The red-brick building down the road was gone. Almost every building featured in the street view photo above is no longer there. It was a reminder to treasure what you have, and who you love. 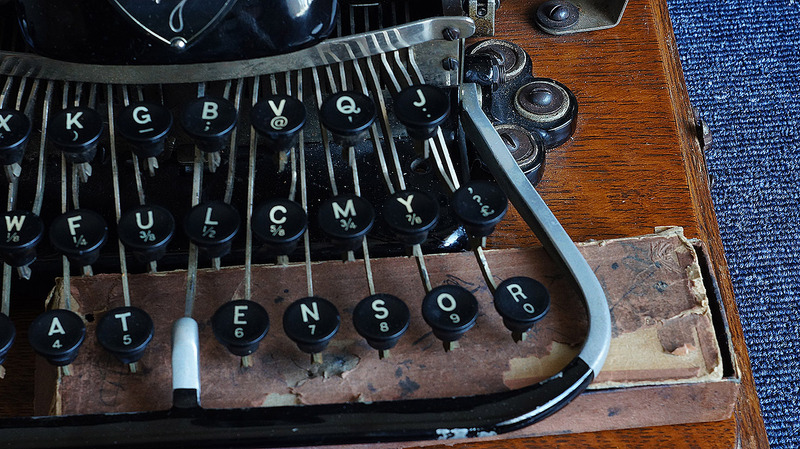 Some things – like old Blickensderfer typewriters may last a very long time, but nothing lasts forever. I first must compliment you on the excellent ordering and presentation of this post, it came across very well. Having grown up in Michigan, earthquakes were a thing that you could feel the slightest rumble from every twenty years if you happened to be in the right place. Any violent force of nature aside from the tornado was unknown. My first personal experience with any kind of destruction like that was when my cousins drove me down a road where a tornado had run into a group of a dozen or so houses. They were all obliterated except for the 1800s brick farmhouse, but an entire corner of the building was ripped away and scattered across the yard, where a child’s bedroom had once been. Seeing the toys and clothes literally hanging off the side of the building was a memory that has stuck with me ever since. Here in Washington we have earthquakes and volcanoes to worry about, the extreme beauty of the prominent mountain hiding a darker reality that one day it too will erupt, potentially like Mt St Helens, except there are a million people who would be affected by the blast. Thankfully that eruption let out a lot of pressure underground so nothing major should happen in the next few hundred years…hopefully… because there sure isn’t enough research and observation on the number of volcanoes around here. Thanks for that Nick. Alway struggling here to format multiple complex topics into the quickly read format of a blog. That sounds like a very intense experience that you went though. Australia is largely earthquake free, so we rarely see such destruction here. However, we do get the worst from fires and floods. I’ve also been very interested in what happens with Mt St Helens since I read about it in national geographic back in the early 80’s. The idea of a volcano was always quite terrifying to me since then – until I visited Hawaii in the late 80’s and actually walked into the volcano itself. Scott, I enjoyed this wonderful essay, the mix of the personal with the historic is intriguing. Thank you. I try to keep it more on the personal than anything else. Sadly this is true. We really are lucky here in Australia, in that we don’t see that kind of destruction and death very often at all. Sometimes I feel that we must be living on borrowed time.